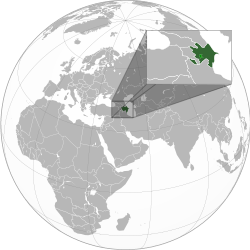 Location o Azerbaijan (green) an Nagorno-Karabakh (licht green). Azerbaijan (Azerbaijani: Azərbaycan), offeecially the Republic o Azerbaijan (Azerbaijani: Azərbaycan Respublikası) is the lairgest kintra in the Sooth Caucasus region o Eurasie. Locatit at the crossroads o Eastren Europe an Wastren Asie, it is boondit bi the Caspian Sea tae the east, Roushie tae the north, Georgie tae the northwast, Armenie tae the wast, an Iran tae the sooth. The exclave o Nakhchivan is boondit bi Armenie tae the north an east, Iran tae the sooth an wast, while haein a short borderline wi Turkey tae the northwast. The enclaves o Karki, Yuxarı Əskipara, Barxudarlı an Sofulu are surroondit bi Armenie an hae been controlled bi it syne the Nagorno-Karabakh War. The majority-Armenian populatit Nagorno-Karabakh region in the southwest o Azerbaijan declared itself independent frae Azerbaijan in 1991, but it is no diplomatically recognised bi ony naition an is still considered a de jure pairt o Azerbaijan, bein occupied bi Armenian forces. Azerbaijan Democratic Republic wis the first successfu attempt tae establish a democratic an secular republic in the Muslim warld. Nouadays Azerbaijan, a naition wi a majority Turkic an Shi‘ite Muslim population, is a secular an a unitary republic wi an auncient an historic cultural heritage. Azerbaijan haes diplomatic relations wi 158 kinrtas sae far an haulds membership in 38 internaitional organisations. Azerbaijan is ane o the foondin members o GUAM an the Organisation for the Prohibition o Chemical Weapons, an jynt the Commonwealth o Independent States in September 1993. On 9 Mey 2006 Azerbaijan wis electit tae membership in the newly established Human Richts Council bi the Unitit Naitions General Assembly. The term o office began on 19 Juin 2006. A Special Envoy o the European Commission is present in the kintra, which is an' a' a member o the Unitit Naitions, the OSCE, the Council o Europe, an the NATO Partnership for Peace (PfP) program. The kintra an aa haulds observer status in the Non-Aligned Movement an Warld Tred Organisation an is a correspondent at the Internaitional Telecommunication Union. Azerbaijan is ane o the sax independent Turkic States as o 1991. The name o Azerbaijan derives frae Atropates, a Persian satrap unner the Achaemenid Empire, that wis later reinstatit as the satrap o Media unner Alexander the Great. The oreeginal etymology o this name is thocht tae hae its roots in the auncient Iranian releegion o Zoroastrianism. In the Avesta, Frawardin Yasht ("Hymn tae the Guardian Angels"), thare is a mention o âterepâtahe ashaonô fravashîm ýazamaide, which literally translates frae Avestan as "we worship the Fravashi o the holy Atare-pata". Atropates ruled ower the region o Atropatene (present-day Iranian Azerbaijan). The name "Atropates" itself is the Greek transliteration o an Auld-Iranian, probably Median, compoondit name wi the meanin "Protectit bi the (Holy) Fire". The Greek name is mentioned bi Diodorus Siculus an Strabo, an it is continued as ādurbādagān in the Middle Persian geographical text Shahrestānihā i Erānshahr. The wird is translatable as baith "the treasury" an "the treasurer" o fire in Modren Persian. ↑ The Nagorno-Karabakh Republic is a de facto independent state that is lairgely recognised as de jure pairt o Azerbaijan. ↑ "Azərbaycanda Əhalinin Sayı Açıqlandı" [Population of Azerbaijan Announced] (in Azerbaijani). 15 December 2014. ↑ "Human Development Index, 2012 Update". United Nations. 2011. Archived frae the oreeginal on 21 January 2012. Retrieved 15 June 2012. ↑ Azerbaijan mey be considered tae be in Asie an/or Europe. The UN classification o warld regions places Azerbaijan in Wastern Asie; the CIA World Factbook CIA.gov, NationalGeographic.com, an Encyclopædia Britannica an' a' place Georgie in Asie. Conversely, numerous sources place Azerbaijan in Europe such as the BBC NEWS.bbc.co.uk, Oxford Reference Online OxfordReference.com, Merriam-Webster's Collegiate Dictionary, and www.worldatlas.com. ↑ Tadeusz Swietochowski. Russia and Azerbaijan: A Borderland in Transition. Columbia University Press, 1995. ISBN 0-231-07068-3, 9780231070683, p.69. ↑ "Country Profile: Azerbaijan". British Foreign & Commonwealth Office (FCO). 2009. Archived frae the oreeginal on 2008-04-10. Retrieved 2009-07-07. ↑ "Azerbaijan". World Factbook. CIA. 2009. Retrieved 2009-06-04. ↑ "Azerbaijan". Background Note. U.S. Department of State. 2009. Retrieved 2009-06-04. ↑ 16.0 16.1 "AUK Foreign Office – Country Profiles: Azerbaijan". FCO.gov.uk. Archived frae the oreeginal on 2003-07-31. Retrieved 2007-05-26. ↑ "US State Department 1993 Country Reports on Economic Practice and Trade Reports: Azerbaijan". ↑ "Elections & Appointments – Human Rights Council". Un.org. Retrieved 2009-01-03. ↑ Minorsky, V.; Minorsky, V. "Ādharbaydjān (Azarbāydjān )." Encyclopaedia of Islam. Edited by: P.Bearman, Th. Bianquis, C.E. Bosworth, E. van Donzel and W.P. Heinrichs. Brill, 2007. Brill Online. EncIslam.brill.nl. ↑ Lendering, Jona. "Atropates (Biography)". Livius.org. Retrieved 2007-12-10. ↑ Chaumont, M. L. (1989). "Atropates". Encyclopaedia Iranica. 3.1. London: Routledge & Kegan Paul. ↑ Historical Dictionary of Azerbaijan by Tadeusz Swietochowski and Brian C. Collins. The Scarecrow Press, Inc., Lanham, Maryland (1999), ISBN 0-8108-3550-9. Retrieved 7 June 2006. ↑ "Frawardin Yasht ("Hymn to the Guardian Angels") – translated by James Darmesteter (From Sacred Books of the East, American Edition, 1898)". ↑ ed. Touraj Daryaee, Mazda Publishers, Costa Mesa 2002. Wikimedia Commons haes media relatit tae Azerbaijan.